Every cigar aficionado knows that the first part of enjoying your cigar takes place well before you light a match. 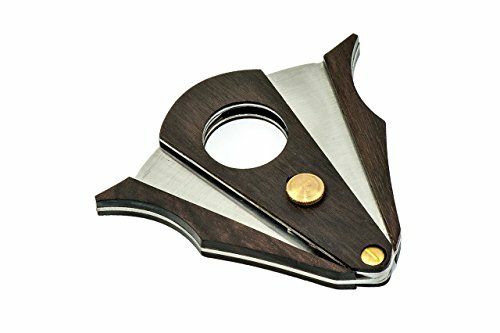 To best enjoy the flavor and aroma of your cigar, without the concern of the wrapper unraveling as it burns, you need the highest quality cigar cutter. This specialty cutter, made by Cosacasa, is perhaps the most ergonomic cigar cutter of its time. Designed with a spring-loaded apparatus, this sturdy cutter is complete with a secure grip that fits snugly in your hand. Unlike most cigar cutters, which are single guillotine, with power only based on the pressure from your fingers, this cutter's dual guillotine promises a smooth cut - without the finger strain! This cutter also comes in two designs, wood and stainless steel, and can fit in any humidor accessory drawer. Make the most of your cigar cutting experience by treating yourself to this high-quality cutter. We guarantee you will enjoy your perfectly cut cigar every time! Strong and sturdy, will last a lifetime. If you have any questions about this product by Cosacasa, contact us by completing and submitting the form below. If you are looking for a specif part number, please include it with your message.